Normally binary counters are used for counting the number of pulses coming at the input line in a specified time period. The binary counters must possess memory since it has to remember its past states. As the name suggests, it is a circuit which counts.The main purpose of the counter is to record the number of occurrence of some input. Asynchronous (Ripple) Counters – The first flip-flop is clocked by the external clock pulse, and then each successive flip-flop is clocked by the Q or Q’ output of the previous flip-flop. 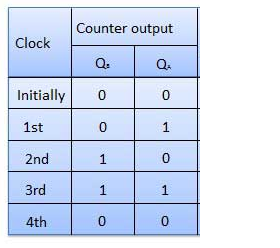 Synchronous Counters – All memory elements are simultaneously triggered by the same clock. A two-bit asynchronous counter is shown below in fig.1. The toggle(T) flip-flops are being used. But we can use the JK flip-flop also with J and K connected permanently to logic 1. The external clock is connected to the clock input of the first flip-flop (FF-A) only and QA output is applied to the clock input of the next flip-flop i.e. FF-B. So, FF-A changes state at the falling edge of each clock pulse, but FF-B changes only when triggered by the falling edge of the QA output of FF-A. Because of the inherent propagation delay through a flip-flop, the transition of the input clock pulse and a transition of the QA output of FF-A can never occur at exactly the same time. Therefore, the flip-flops cannot be triggered simultaneously, producing an asynchronous operation. As soon as the first negative clock edge is applied to FF-A, QA will be equal to 1. QA is connected to clock input of FF-B. Since QA has changed from 0 to 1, it is treated as the positive clock edge by FF-B. So, there is no change in QB because FF-B is a negative edge triggered FF. On the arrival of second negative clock edge, FF-A toggles again and QA = 0. The change in QA acts as a negative clock edge for FF-B. So it will also toggle, and QB will be 1. On the arrival of 3rd negative clock edge, FF-A toggles again and QA become 1 from 0. Since this is a positive going change,FF-B does not respond to it and remains inactive. So QB does not change and continues to be equal to 1. On the arrival of 4th negative clock edge, FF-A toggles again and QA become 1 from 0. This negative change in QA acts as clock pulse for FF-B. Hence it toggles to change QB from 1 to 0. If the “clock” pulses are applied to all the flip-flops in a counter simultaneously, then such a counter is called as synchronous counter. The JA and KA inputs of FF-A are tied to logic 1. So FF-A will work as a toggle flip-flop. The JB and KB inputs are connected to QA. As soon as the first negative clock edge is applied, FF-A will toggle and QA will change from 0 to 1. But at the instant of application of negative clock edge, QA ,JB = KB =0 Hence FF-B will not change its state. So QB will remain 0. On the arrival of second negative clock edge, FF-A toggles again and QA change from 1 to 0. But at this instant QA was 1. So JB = KB=1 and FF-B will toggle. Hence QB changes from 0 to 1. On application of the third falling clock edge, FF-A will toggle from 0 to 1 but there is no change of state for FF-B. On application of the next clock pulse, QA will change from 1 to 0 as QB will also change from 1 to 0. Depending on the way in which the counting progresses, the synchronous or asynchronous counters are classified as follows. In the up/down counter, up counter and down counter are combined together to obtain an UP/DOWN counter. A mode control (M) input is also provided to select either up or down mode. A combinational circuit is required to be designed and used between each pair of flip-flop in order to achieve the up/down operation. In the UP/DOWN ripple counter all the FFs operate in the toggle mode. So either T flip-flops or JK flip-flops are to be used. The LSB flip-flop receives clock directly. But the clock to every other FF is obtained from (Q or Q bar) output of the previous FF. UP counting mode (M=0): The Q output of the preceding FF is connected to the clock of the next stage if up counting is to be achieved. For this mode, the mode select input M is at logic 0 (M=0). DOWN counting mode (M=1) : If M =1, then the Q bar output of the preceding FF is connected to the next FF. This will operate the counter in the down counting mode. 3-bit binary up/down ripple counter. 3-bit : hence three FFs are required. UP/DOWN : So a mode control input is essential. For a ripple up counter, the Q output of preceding FF is connected to the clock input of the next one. For a ripple down counter, the Q bar output of preceding FF is connected to the clock input of the next one. Let the selection of Q and Q bar output of the preceding FF be controlled by the mode control input M such that, If M = 0, UP counting. So connect Q to CLK. If M = 1, DOWN counting. So connect Q bar to CLK. If M = 0 and M bar = 1, then the AND gates 1 and 3 in fig. will be enabled whereas the AND gates 2 and 4 will be disabled. Hence QA gets connected to the clock input of FF-B and QB gets connected to the clock input of FF-C. These connections are same as those for the normal up counter. Thus with M = 0 the circuit work as an up counter. If M = 1, then AND gates 2 and 4 in fig. are enabled whereas the AND gates 1 and 3 are disabled. Hence QA bar gets connected to the clock input of FF-B and QB bar gets connected to the clock input of FF-C. These connections will produce a down counter. Thus with M = 1 the circuit works as a down counter. The circuit above is of a simple 3-bit Up/Down synchronous counter using JK flip-flops configured to operate as toggle or T-type flip-flops giving a maximum count of zero (000) to seven (111) and back to zero again. Hence, the 3-Bit counter advances upward in sequence (0,1,2,3,4,5,6,7) or downwards in reverse sequence (7,6,5,4,3,2,1,0).